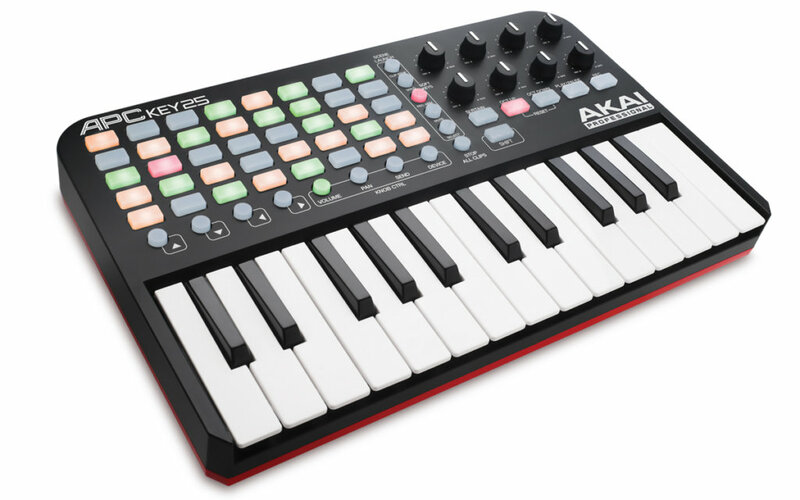 Akai has really gone all out on its collaboration with Ableton over the last few years, producing a number of Ableton Performance Controller (APC) hardware units in close co-operation with the software developer. 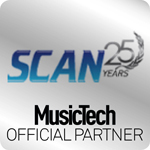 As is usually the case, such partnerships are able to achieve integration that isn’t possible by simply bundling MIDI maps for other people’s software. 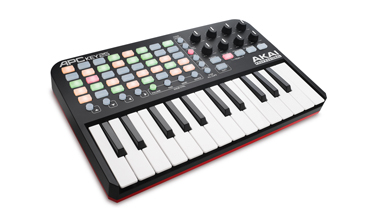 The company’s latest is the APC Key 25, the only APC model with a keyboard. It manages to fit a surprising amount of functionality in too, so it will certainly be of interest to Live users. The first thing to say about the Key 25 is that it is very compact. It’s insanely portable and very light indeed, though its all-plastic construction, while solid, means you’ll probably not want to throw it around too much. There’s a single USB port on the side that you use to connect to your Mac or PC, and it’s class compliant so no drivers are required. Power and MIDI are also handled by this connection so there’s no need for a power supply. It’s pre-mapped for Live and you’ll find that the controls map across beautifully, with red outlines appearing in the software to denote what you’re currently controlling. 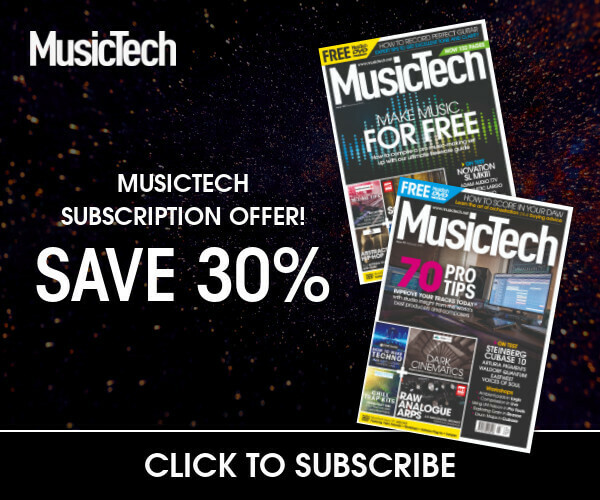 It can be used as a generic MIDI controller too, though you’ll want to check with Akai exactly how well supported your particular choice of third-party software is. You get 25 synth action mini keys, and while you won’t be playing any sonatas on these they are perfectly decent for basslines, melodies and simple chords. 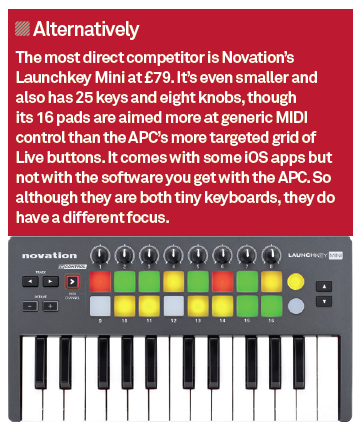 Despite being small they’re well-designed and will certainly do the job of letting you input clips accurately, though, as you might expect, they’re better suited to synth or beat-style playing than anything too complex. There’s enough travel in the keybed that note presses register convincingly, and having a keyboard in such a compact unit in addition to all the other controls is a real bonus. The only omission is a sustain pedal input, though you do get a sustain button which kind of takes its place. The rest of the front panel is taken up by the Live controls. Most prominent is the 5×8 multicoloured grid that lets you launch clips. As mentioned, the software displays which section of a project is currently being controlled and you can move this area around using the arrow keys on the keyboard for better navigation. The three clip status modes (loaded, playing and recording) are displayed using different coloured backlights, and the grid feels just right with button sizes and spacing ample enough that you don’t accidentally hit one while aiming for another. You can also control rows of clips at a time using the Scene Launch buttons, and the Shift button provides access to a bunch of alternate functions for many controls, greatly expanding the usefulness of the hardware. 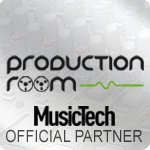 To the right are eight assignable knobs and you can toggle their function easily between pan, volume, sends and device control as well as effect levels, filters and more. The knobs are of good quality and move fluidly but with just the right amount of resistance. Under these are some more performance controls including octave up and down, so you can play beyond the physical 25-note key range as well as play, pause and record controls for clips, and a sustain button for manually entering sustain values in lieu of a pedal. 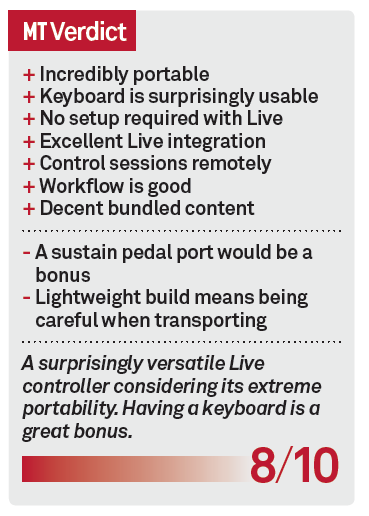 The keyboard comes with some software too, including a version of Live Lite. 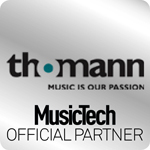 There are also two synths, Hybrid 3 by AIR and SONiVOX Twist, to play with, and Toolroom artist launch packs available for download after registering online. 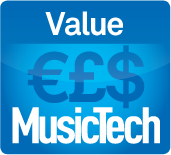 So even if you have nothing else before buying the Key 25 there’s enough bundled content that you can be making music quickly without having to spend more money. 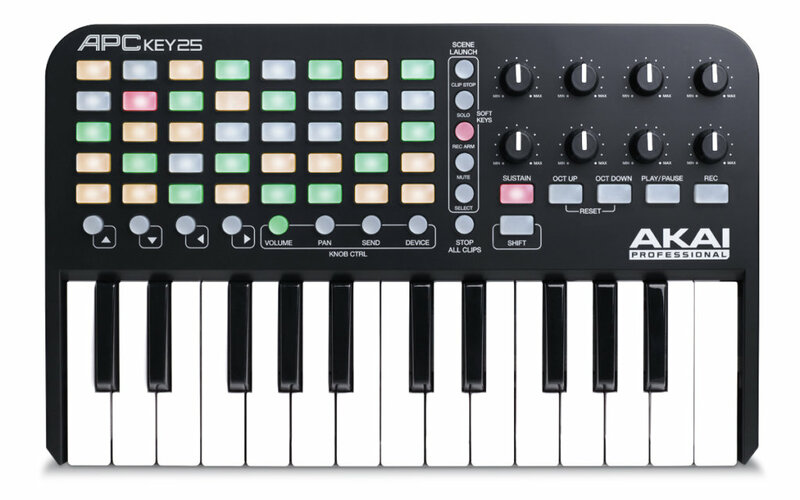 The APC Key 25 is a really cool little controller for Live. It doesn’t have the faders of the APC Mini but it does have eight knobs which can more or less be deputised to perform a similar function, and crucially it has the keyboard. A lot of people who use a Live controller will also have a MIDI keyboard connected, so with the Key 25 you’re killing two birds with one stone. Even though the keys are small they’re still perfectly fine for synth melodies, basslines and beats. And its tiny footprint means it’s also good for those pressed for space, or for working on the move.